Oven-drying tomatoes uses the same principle as how to dry herbs -- low temperatures for a few hours. 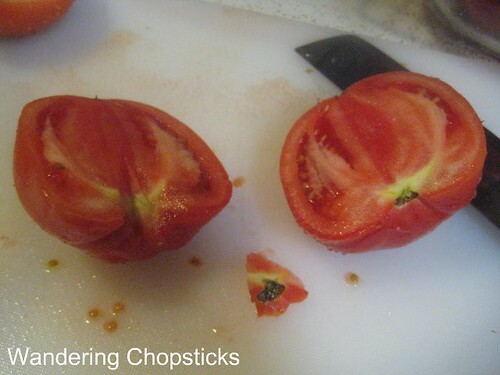 Some people only halve or quarter the tomatoes, but I like mine in bite-sized pieces so I can easily add them into pastas. Plus, smaller pieces means faster drying time. I also like the tomatoes still a little moist with a bit of chew. I made several batches. Some I simply seasoned with salt. One batch I drizzled some olive oil, and added ground black pepper and oregano, before popping the tomatoes in the oven. 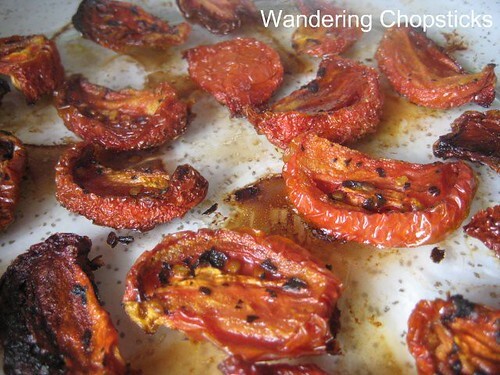 Optional: Drizzle and season with olive oil, ground black pepper, or oregano before drying the tomatoes. 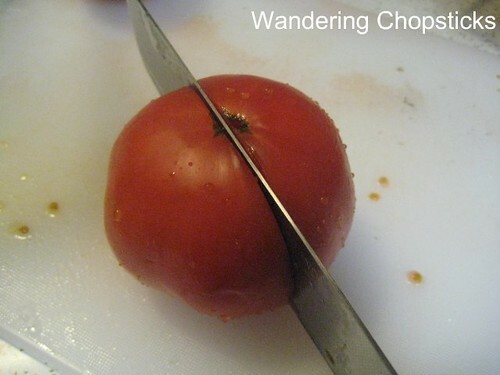 As if you don't know how to cut tomatoes. So I begin by slicing them in half. Then removing the stem part. After slicing them into quarters, I turn them sideways and slice again. Lay them on a rack with a pan to catch any liquid. Sprinkle on a bit of salt. 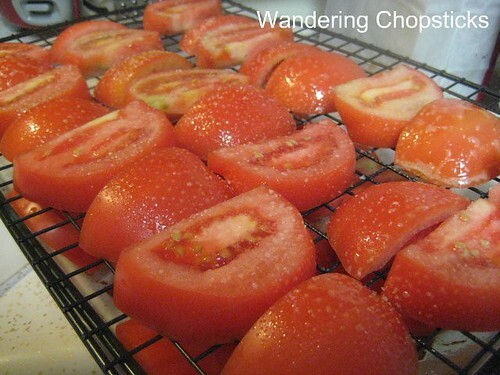 Not too much because the flavors will concentrate as the tomatoes dry out and you don't want them too salty. 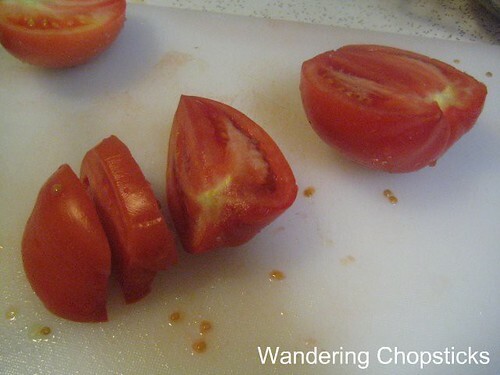 If you want to add the olive oil, ground black pepper, or oregano, toss the tomatoes with the mixture in a bowl first. Pop them in the oven at 200 degrees for at least an hour, possibly two hours. Check on them every half hour and remove done pieces or you'll get some burnt ones. Eat the oven-dried tomatoes as a snack or add to pastas and salads. Store in a plastic bag in the freezer until ready to use. 1 year ago today, Pho Pasteur - Rosemead. All Text and Photos Copyright © 2006-2019 by Wandering Chopsticks. So this is another version of sun dried tomatoes? Yumzz...looks good! Sun dried pricey here..i will try making oven dried tomatoes for my pasta next time. Laughing at the comment on the freezing winters in SoCal. Gotta get those snow shovels ready! i am intriqued! this i CAN do in my humble oven hehehe. thanks for the tips! And wool socks and flannel-lined jeans and earmuffs. Oh, don't remind me of real winters. Brrr. Thank you for stopping by. I try to respond in a timely manner, but am not always able to do so. If you're awaiting a response, check the post in which the comment is made or click the "Notify me" option. If you're not a blogger and you'd like to leave a comment, you can do so using your Google/Gmail account. I welcome questions, discussions, and feedback, but please be mindful that this is my home online. I reserve the right to delete any comment that is anonymous or unknown, rude, promotional, or has a link. Editor's Note: Spacing has been wonky on random posts, jumbling words into big blocks of text. If you come across any like that, please comment on the post to let me know so I can fix them. Thanks! Blogrolling: Will You Be My Friend? Design: Layout, Navigation, and "Above the Fold"
View all Wandering Chopsticks Flickr photos or click on a photo below for a link to the original post.